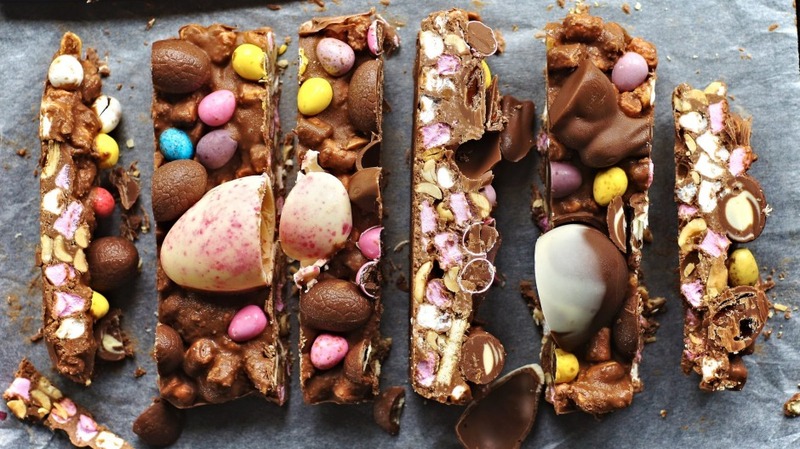 Use a mix of solid, filled and candy-coated eggs to create this rocky road eggs-plosion! 1. Grease and line a 25cm x 16cm cake tin with baking paper, allowing the sides to overhang. 2. Melt the chocolate in a heat-proof bowl over a saucepan of simmering water, stirring occasionally with a metal spoon until smooth (about two to three minutes). Set aside to cool slightly. 3. Combine the remaining ingredients in a bowl, reserving about three-quarters of a cup of the Easter eggs to decorate the top of the rocky road. Pour over the melted chocolate and stir gently until evenly coated. 4. Spread the mixture evenly in the baking tin before scattering over the remaining Easter eggs. 5. Set aside for a few hours to set or place in the fridge to harden completely. 6. Once set, turn out onto a clean surface and using a hot knife, cut into chunks using a hot knife. Rocky road can be stored in an airtight container in the pantry or fridge for up to two weeks. If you like this recipe, try Katrina's three remixed rocky road recipes.